Please consult the photograph above for details of the food’s packaging, design and wholesale presentation. Additional images of the recalled Raw Ground Beef and Pork Sausage can be found on the Web site above. According to the USDA, the products subject to recall bear establishment number “EST. 45742” inside the USDA mark of inspection. These items were shipped to retail locations in Florida and Georgia. The problem was discovered on March 12, 2019 by US Department of Agriculture’s Food Safety and Inspection Service (“FSIS”) personnel during a food safety assessment at the establishment. ==> For information about Soy Allergy, please consult the “Allergens & Intolerances” tab on this site, located at the top of this page. 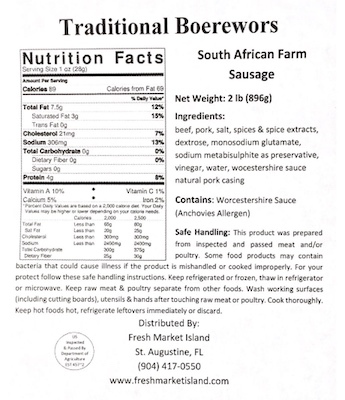 If you believe you have purchased or have in your possession any of these recalled Raw Ground Beef and Pork Sausage products and could be allergic to their Soy ingredients, have a close family member who is allergic or has previously experienced Anaphylaxis or are unsure of your allergy status, please do not consume them. Instead, return the product to the distributor or wholesaler where you purchased it for a full refund. If you believe you have purchased or have in your possession the recalled Raw Ground Beef and Pork Sausage, please do not consume them directly nor use them as an ingredient in another dish or preparation. Instead, kindly return the product to the store where you purchased it for a full refund. If you have any questions about this recall notification, please contact Carnivore Meat Company owner Virginia Botha at 1-615-614-3134 during normal business hours, Central Standard Time, Monday to Friday.